The Gulf of Mexico Florida coast offers a wide variety of vacation options. Panama City Beach vacation rentals make up some of those wonderful options. Those looking to enjoy the Florida sunshine, blue skies, palm trees and white, sandy beaches need look no further than the Twin Palms Condominiums. This 21-story resort condominium faces the water and offers a 200 foot long section of inviting, tropical beaches. This refreshing and affordable oasis is located right in the heart of Panama City Beach on Front Beach Road. Guests staying at the Twin Palms can expect to enjoy luxurious accommodations with 9 foot ceilings surrounded with crown molding. The keyless entry of each room will provide the security desired by all guests. Each condo has a fully-equipped kitchen that allows guests to store and prepare meals as desired. Cable TV is also provided to help keep guests informed and entertained. The over-sized, private balcony allows guests to begin their day greeting the sunrise and end their day bidding the sun a temporary farewell. Every living room also faces the water so that guests may enjoy the beautiful views of the Gulf of Mexico while relaxing on the sofa and chairs. Sleeping arrangements come in floor plans of spacious one or two bedroom layouts. Each unit also comes equipped with a washer and dryer for guests’ use. Panama City Beach has been voted one of the “Best Beaches in Florida” thanks to its sugar white sand and emerald green waters. 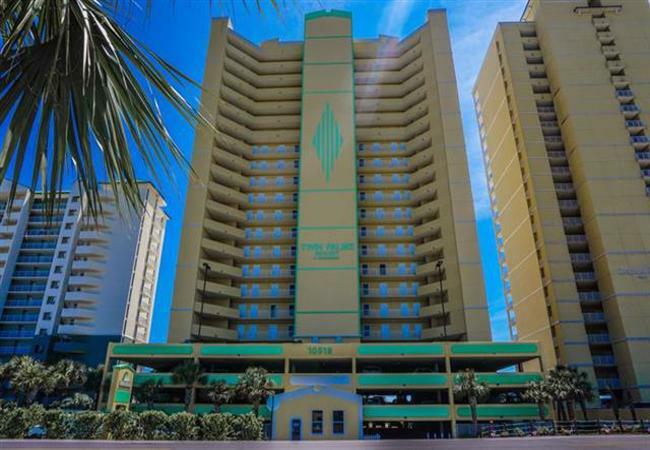 The Twin Palms Condominiums provides guests the opportunity to enjoy the Panama City Beach vacation rentals scene at lower prices. With a pool located right on the Gulf of Mexico and a private beach, there will be plenty of time to soak up that gorgeous Florida sunshine. Guests can also relax in either the outdoor or indoor hot tubs. The sauna and steam room along with the exercise room are the perfect additions to a getaway. One other amenity that is greatly appreciated by guests is the covered parking that helps to keep your car out of the sun’s rays. Panama City Beach provides guests with a world of entertainment options. Local restaurants provide an abundant choice of menu options including fresh, local seafood. Go fishing or diving in the gorgeous Gulf Coast waters. For an unforgettable adventure, swim with dolphins, rent a Waverunner or go para-sailing. Play a round or two of golf at a local course. Of course, there are plenty of shopping opportunities available to find that perfect souvenir. This and much more can be found by staying at the wonderful Twin Palm Condominiums.